Lincoln businessman Tom Gardner points illustrates some of his land holdings as he speaks at an anti-national park rally Thursday, June 18. 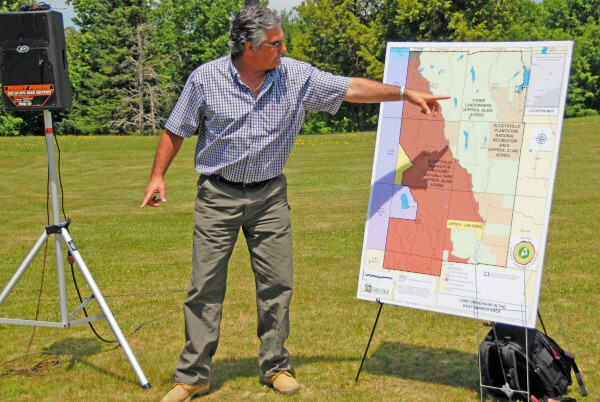 MEDWAY, Maine — Opponents of a proposed 150,000-acre national park and recreation area east of Baxter State Park held a rally Thursday, during which they presented a list of 224 businesses directly employing more than 3,900 people that don’t want to see the plan realized. Possibly the strongest single display of opposition to the proposal since Lucas St. Clair began leading the call for a park in 2012, the businesses include some of the biggest logging, papermaking, forestry, land management and trucking companies in the state. One businessman, Tom Gardner of Lincoln, said he feared that state loggers would have their access to Maine woodlands compromised by the National Park Service. He said that if the proposal grows to 150,000 acres, its projected limit, forestry companies would have to spend hundreds of thousands of dollars building new backwoods access roads. “We don’t want anything to do with the federal government in my business. Bringing the federal government here is a mistake,” Gardner said during the 30-minute rally outside the Gateway Inn attended by about 60 people. St. Clair spokesman David Farmer disagreed. He cited several examples of national parks and lumber companies in Oregon and Montana where forestry rubs right up against park boundaries without difficulties. Earlier this year, park proponents presented a list of 200 businesses that support the plan. St. Clair’s proposal includes establishing a 75,000-acre national park and a 75,000-acre recreation area on family land east of Baxter State Park by 2016. St. Clair’s mother, Roxanne Quimby, began a campaign to give 70,000 acres to the National Park Service in 2011. Through his company Elliotsville Plantation Inc., the Quimby family owns about 87,500 acres within the proposed park and recreation area boundaries. That’s about 66,000 acres within the park area and 21,500 in the multiuse recreational zone. The land is east of Baxter State Park. Proponents said a park would generate 400 to 1,000 jobs, be maintained by $40 million in private endowments, diversify a Katahdin-region economy devastated by the closure of two paper mills, and coexist with existing industries. Park opponents have said they fear a park would bring unwanted federal authority into Maine, cramp the state’s forest products industries with tight restrictions, generate only low-paying jobs and morph into a 3.2 million-acre park plan offered in the 1990s. Opponents also lambaste St. Clair for failing to reveal until this week the approximate number of acres his family owns in the area, saying it is an example of the proposal’s disingenuousness. Rally speakers reiterated all of those points with some new voices. Gardner is president of Gardner & Sons Inc. and said he owns about 17,000 acres near the proposed park area. Present state regulations, Gardner said, make it difficult enough for state foresters to do business. The road buildout, he said, would have to occur if the park and recreation area actually reached 150,000 acres. “I think you would have to bring the infrastructure in that area to a higher level if a park were built in that area,” Gardner said. The opposing businesses include Verso Corp. of Bucksport, American Forest Management of Milford, Freightliner of Maine, EJ Carrier Inc. of Jackman, Madison Paper Industries in Madison and Orion Timberlands of Ashland. The Maine Woods Coalition and the snowmobile association created the 224-business list through petitions, websites and one-on-one outreach, coalition spokesman Ted O’Meara said. The rally occurred hours before a park debate scheduled for 6 p.m. at Schenck High School in East Millinocket. The debate will feature St. Clair and Kristen Brengel from the National Parks Conservation Association debating park opponents Bob Meyers, executive director of the Maine Snowmobile Association, and Patrick Strauch, executive director of the Maine Forest Products Council. David Farmer, spokesman for Lucas St. Clair, writes a weekly OpEd for the BDN.